The Sewer in Skelattack is one of the oldest areas, being in my builds since 2015! 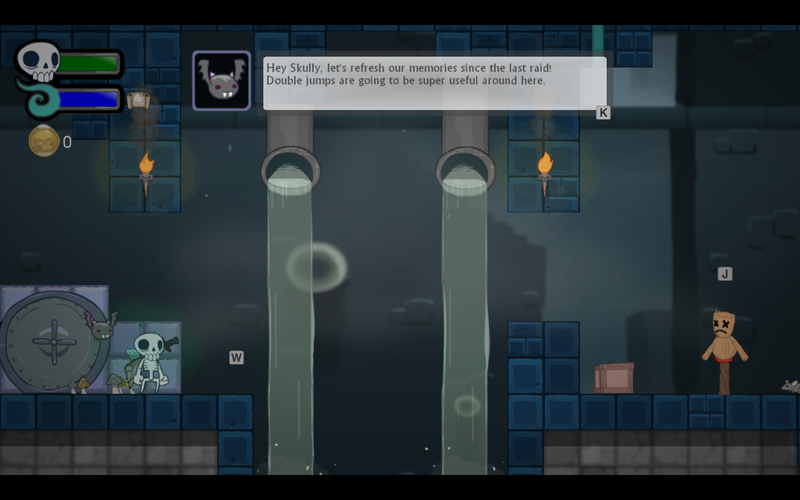 The level layout has gone through many changes, but the background always stayed mostly the same. When I first painted it, I was very nervous about doing backgrounds and environments. This past week I randomly decided to scrap it and start fresh. Here’s the old background. It's not terrible, but there’s not much here to show that you are in a sewer. 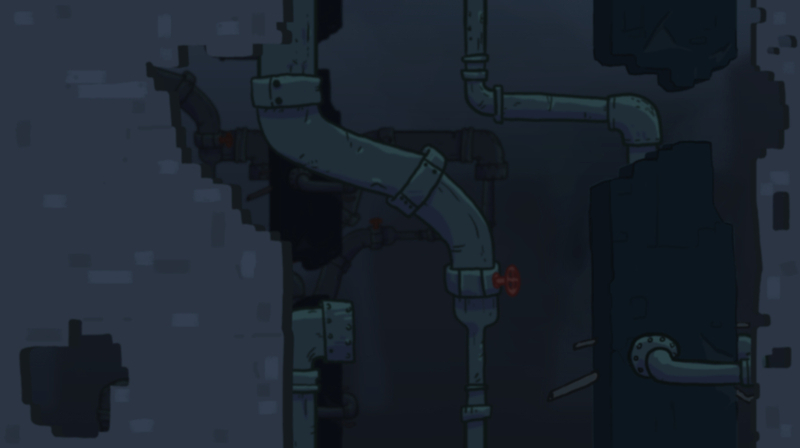 I hopped into Photoshop and started laying out some tile-able artwork that would become the new Sewer. Tiled background art used to be tricky, but now it’s just fun! I wanted to focus on a tangled, never-ending series of aging pipes, as well as crumbling architecture. This area is not cozy at all, and is in terrible disrepair. 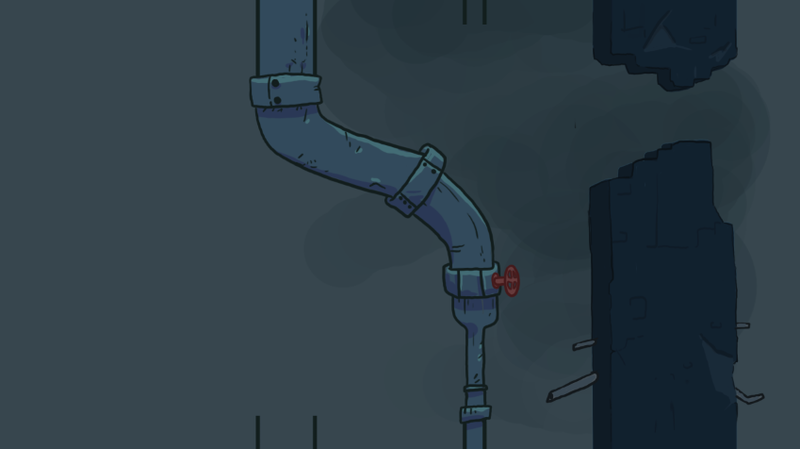 Having fun with cartoony pipes! Once I was happy with the art, I needed to darken it and also apply a slight blur. This keeps the background where it belongs, keeping Skully and dungeon terrain solidly in the foreground. Sometimes you will see games where it’s very difficult to tell what you can jump on and what you can’t, because all of the art seems to exist in the same plane and shares similar colors. It took a little back and forth to make sure it looked right, but eventually I got there. Final BG pieces with blur/color correction applied. The last thing to do was arrange the background layers and apply parallax! Here is the new Sewer, looking much more open, lonely and ominous. Check the gif below to see how it all looks in motion! If you’ve been following Skelattack’s social media, you know that we are getting ready to show the game at PAX East in Boston! Having just completed PAX South in January, we are confident and excited to hang out with a bunch of new people and give away some interesting prizes for doing things in the demo ;) If you’re in the area, we’d love to see you at our booth! We will be showing the game every day of PAX. 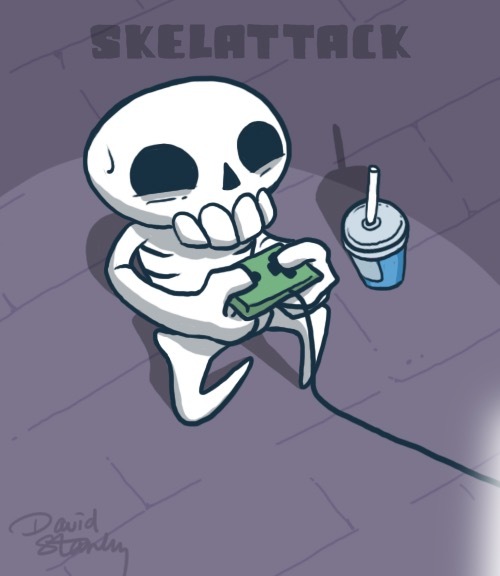 Our Kickstarter for Skelattack will also be running at that time!